The differences between proofreading and editing may seem minor to many people, but the truth is that there are major differences separating the two. Proofreaders primarily search for errors in the text while editors also look at the overall structure and flow of the piece. Proofreading is the act of reading over a piece of text and correcting any spelling, grammatical, or typographical errors. Since a proofreader can look at text with significantly more perspective than a computer program, proofreaders often catch mistakes that go unnoticed by spelling and grammar checking programs. For example, software programs may not flag the use of "peek" when the text is obviously calling for the word "peak." A seasoned proofreader will catch this mistake easily. 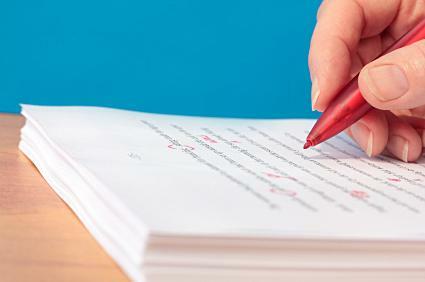 Often, the writer will do his or her own proofreading after the document is complete. However, proofreading experts are often employed to help give an extra layer of polish to the grammar and spelling of important documents like technical papers and government or corporate documents. When someone works as a proofreader, it is expected that he or she will be capable of returning copy to the author and editor that is grammatically flawless and contains perfect spelling. The proofreader is not expected to comment on or "fix" any issues with continuity, tone, or style. Editing is when a document is altered to conform to specific standards of tone, style and continuity. Whereas a proofreader simply looks at the mechanics of text, an editor brings a focused perspective to the document. Editing can include changing the tone of a document to better suit the audience of a publication, providing notes on continuity, or even recommending where citations should be applied. Editing also involves making sure the overall piece is clear, concise and makes sense. Editors work closely with the author of a document to help bring the document up to a certain set of standards. Even excellent writers can miss a few things while writing an article, book, or technical document. An editor makes notes on what needs to be changed, sends those notes back to the author, and helps the author achieve the desired results. Due to this, editors need to be keenly aware of the stylistic demands of their readership and employer. There is some overlap between proofreading and editing, but not a significant amount. Sometimes, editors are expected to proofread the articles they edit. This is generally more common at small-scale or online publishing companies than with larger-scale publishing houses. According the United States Bureau of Labor Statistics, editors can make an average of $50,000 a year, while proofreaders will generally make around $34,000 a year. Since proofreading is concerned with the simple mechanics of the document, it is more of an entry-level position than editing. Editors are expected to be capable of promoting consistency in quality and tone. Due to the greater pressure this involves, the pay is almost always higher for editors than for proofreaders.